When football season hits, it's time to pull out all the stops when it comes to keeping team spirit high. For one youth football league, that meant unleashing The Beast on its teams and their families. The Beast is actually an inflatable tunnel created in the shape of a yellow cougar that players burst through as they run onto the field at home games. And boy has it had a positive impact on the program. Most people are hopeful that inflatable tunnels will enhance their sports marketing efforts. The Beast, however, has gone above and beyond the call. 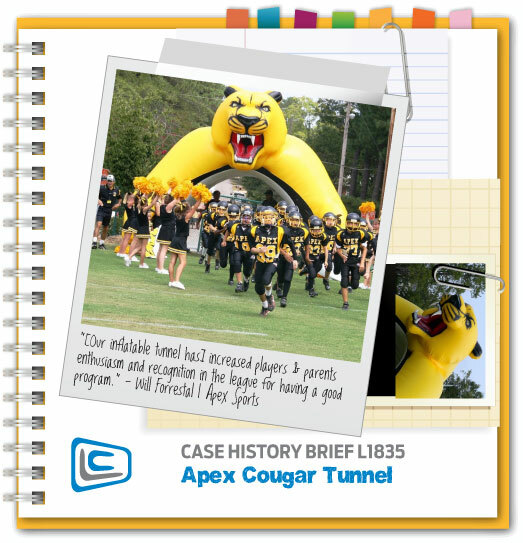 Will Forrestal of Apex Sports Authority explains, "[Our inflatable tunnel has] increased players & parents enthusiasm and recognition in the league for having a good program. Newspaper articles have been written about the team and featured pictures with The Beast. A local TV station even came out and did a story on our football teams. Made the 6:00 evening news. It's been a big hit!" Now that's some excellent sports marketing! In addition to use at football games, the league also breaks out the inflatable tunnel for pep rallies and family picnics. Apex Sports Authority emphasizes the participation of team sports to help foster strong minds and bodies, team spirit, and recognition for academic achievement. They offer programs for football, cheerleading, lacrosse and wrestling. What fun!